Okay, so I know pumpkin is a fall flavor yadda yadda.. but me and Michael love pumpkin flavored everything all the time. 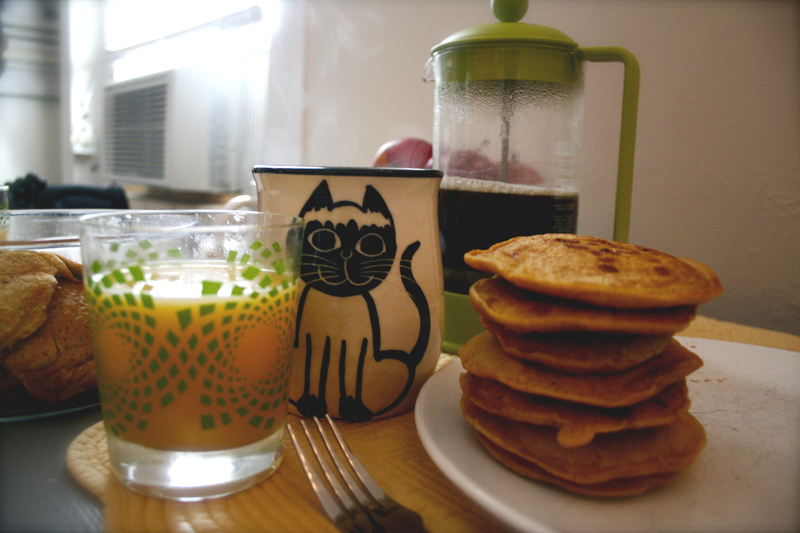 Here is a favorite recipe that we sometime use for vegan pumpkin pancakes that I would seriously recommend! 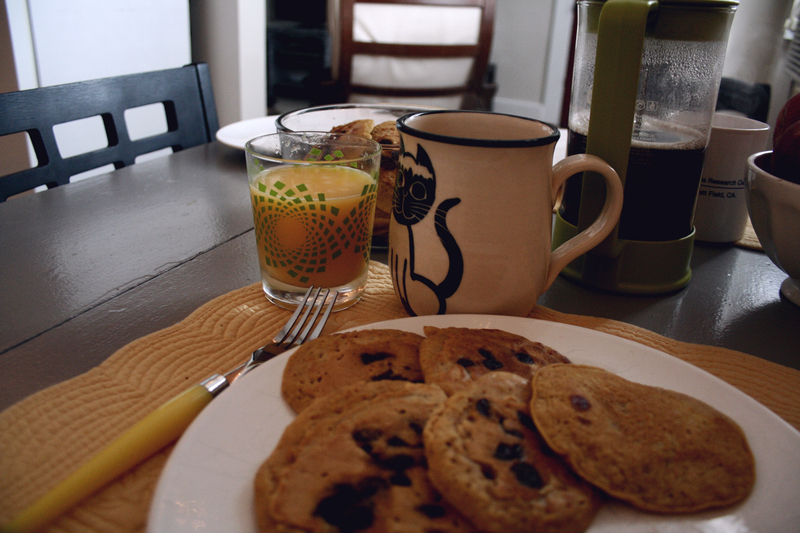 A stack of delicious pancakes and my all time favorite mug! We tossed chocolate chips into some of these and it was awesome. As the original recipe states, they’d also be great with some dried cranberries. Great for a weekend breakfast. Eggnog is something I LOVE about Christmastime. I love the flavor, but it’s so heavy, I have a hard time drinking much of it. This recipe gives you just enough of that yummy eggnog flavor without being too heavy! Mix the eggs, eggnog, cinnamon, and pumpkin pie spice. Soak the bread in the eggnog mix, and cook on an electric skillet at 300 until golden brown [5-10 minutes]. The recipe is really simple and only takes 20 minutes start to finish! If you use thick fresh bread like I did, make sure you let it soak in the eggnog mix for a good long while to make sure it soaks all the way through. 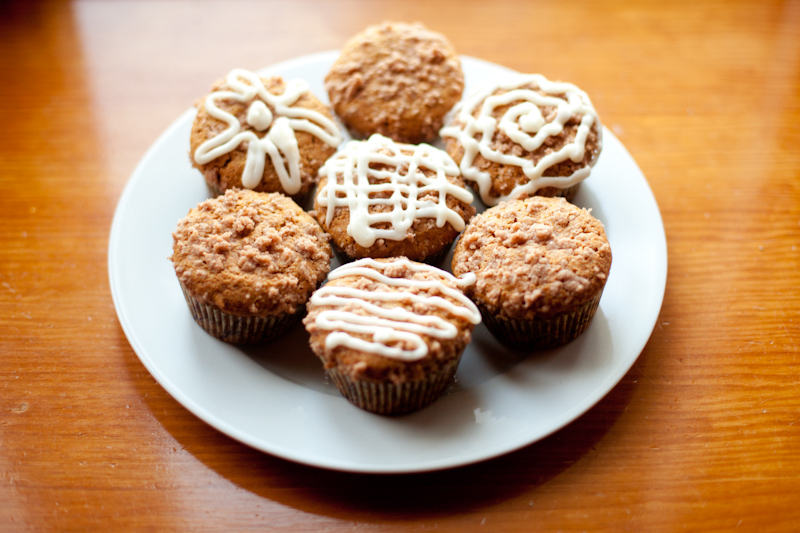 Sprinkle with cinnamon & powdered sugar, drizzle with maple syrup and enjoy! 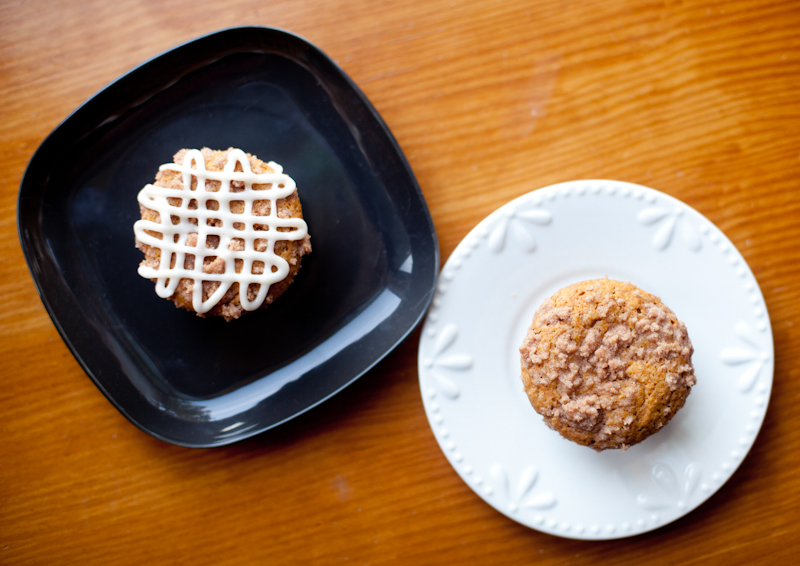 THESE muffins are one of my favorite fall treats. My boyfriend absolutely LOVES when I make them, and my friends and family always eat them right up. They are definitely VERY SWEET, but also very delicious. 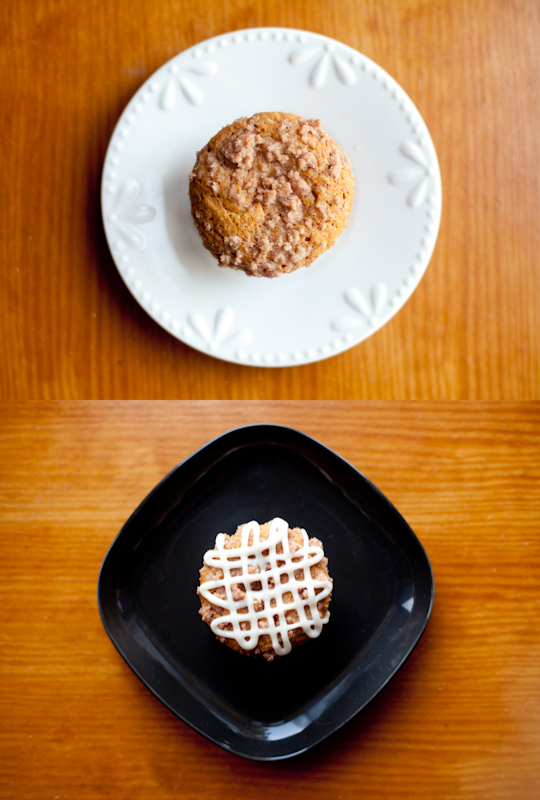 I created the recipe combining a few pumpkin muffin recipes from allrecipes.com , and one for cinnamon coffee cake muffins my mom always makes. This version is not vegan, but I very often make them vegan by using earth balance and Ener-G egg replacer, and they are JUST as good, sometimes better. If you don’t have Ener-G just use your favorite egg substitute! I’ve found the most effective, easy egg substitute for baking is — 2tbs water, 1tbs oil & 2tsp baking powder [mix & then add]. + In a large bowl, combine flour, sugar, pumpkin pie spice, baking soda & salt. + In another bowl, combine eggs, pumpkin & oil; stir into dry ingredients just until moistened. + Place one small spoonful of the batter in each cup. Use the spoon to make sure the entire bottom of each cup is covered. + In another bowl, melt butter for filling. Stir in sugar. Cut in flour & spices. The filling should be moist, coarse crumbs. + Add filling. I just sprinkled it in with my fingers, until a layer forms, adding at least enough to cover batter in each. The more you add, the sweeter they will be. + Add one more spoonful of batter to cover filling. Cups should be about 2/3 of way full. This batter is very heavy so if they are TOO full they won’t rise very well. + For topping, combine sugar, flour & cinnamon. 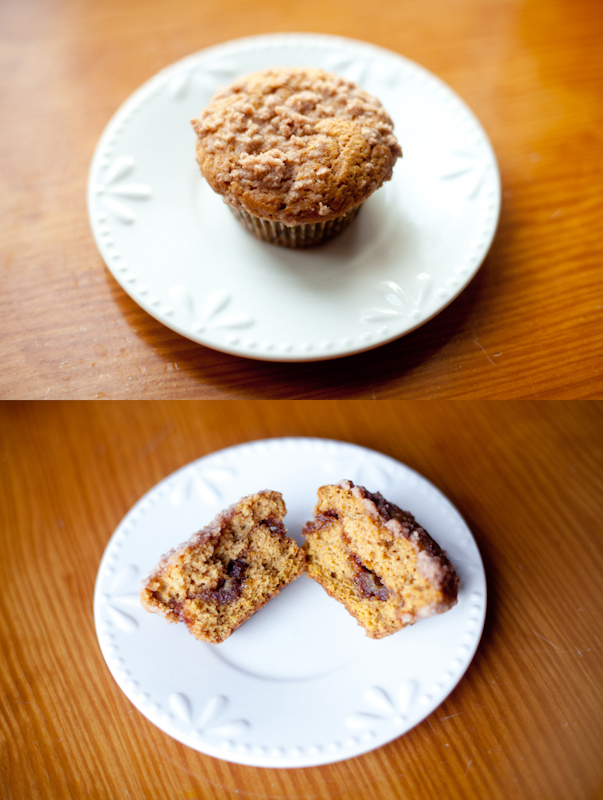 Cut in butter until mixture resembles coarse crumbs; sprinkle over each muffin. Bake @350 for 30-35 minutes, let cool & enjoy! For a little added decadence/to up the cuteness factor, drizzle on some cream cheese frosting!